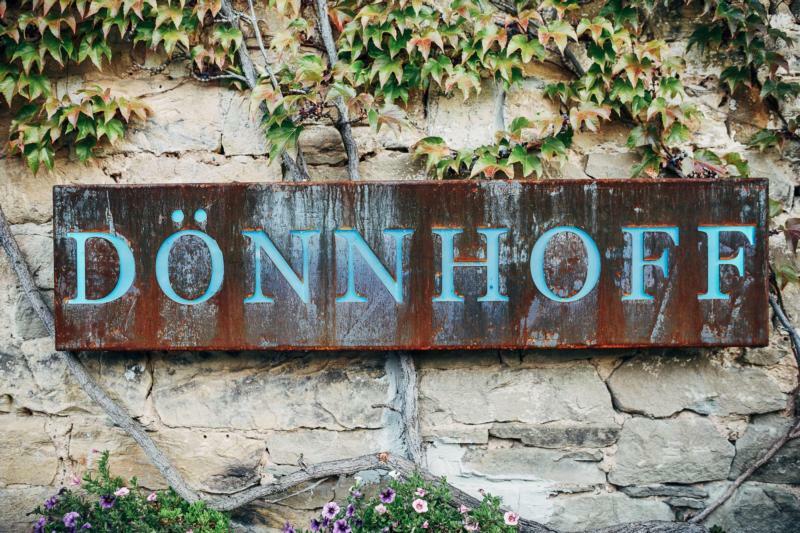 The Dönnhoff family first came to the Nahe region over 200 years ago, and after establishing a modest farm slowly evolved into a full-fledged wine estate. Helmut Dönnhoff has been making the wine since 1971, and now his son Cornelius works alongside in the winery and in their 25 hectares of Erste Lage, or grand cru vineyards. Their holdings represent some of the best in the Nahe and all of Germany. Oberhäuser Leistenberg, the oldest vineyard held by the family, has slate soils and produces fruity wines with elegant acidity. The Schlossböckelheimer Felsenberg is a very old site with porphyry soil. Niederhäuser Hermannshöhle, perhaps the most famous of all the Nahe vineyards, is a slate vineyard with many conglomerates of volcanic rocks, mostly porphyry and melaphyr. The Oberhäuser Brücke, the smallest vineyard in the Nahe, is a tiny parcel saddled on the Nahe River that Dönnhoff owns in entirety. The Brücke has grey slate covered by loess-clay and the vines ripen even later here than in the Hermannshöhle due to large diurnal temperature swings along the river. The Norheimer Dellchen is a steep terraced vineyard in a rocky hollow with porphyry and slate soil. Norheimer Kirscheck sits on a steep south slope of slate soil and produces delicately fruity wines with spice and race. The Kreuznacher Krötenpfuhl vineyard has perfect drainage due its topsoil of pebbles over loam soil; characteristic are wines with a mineralic elegance. Due to the water table that flows beneath the vineyard's soil the Krötenpfhul has always been farmed organically, even before it was held by Dönnhoff. Although the Nahe is a dry region, Dönnhoff does not water their vineyards as to encourage deep rooted vines. The soil is covered with organic material like straw and compost to preserve water and to avoid evaporation and erosion in heavy rains. The vines are all grown on wire frames, low to the ground to benefit from the warmth of the stoney topsoil, and at a density of approx. 6000 vines per hectare. The Riesling vines are old clones sourced from the sites in Niederhausen and Schloßböckelheim. Grapes are always picked by hand at Dönnhoff over 2-3 passes through each vineyard. To preserve laser-like focus and clarity in the wines, the grapes are pressed as soon as possible – within 3 hours of picking. Wines are fermented in traditional German casks (1200 L stuck and 2400 L doppelstuck) as well as stainless steel with spontaneous fermentations. Donnhoff's cellar is unique in its capacity to hold all of its production entirely in stainless steel or in cask, allowing for the ideal elevage for any wine at any point during a vintage. James Suckling 96 "So light and filigree with such a delicate white-peach note. Yet, behind the almost weightless exterior is enormous depth and an almost savage mineral freshness at the finish. From organically grown grapes. Fair'n Green certification. Drink or hold." "This is from the porphyry site, Oberhäuser Felsenberg and the gravelly site Oberhäuser Kiegelburg, and so it’s a mini-Grand Cru. It’s another in a string of beauties, barely perceptible sweetness, literally incredible class, and in my opinion the single greatest white wine value in the world. "This vintage is dancing, giddy, pretty and snappy; the girl has her wits about her, and will, with impeccable charm, tear you a new one if you misbehave. Signature flavors run towards cherry blossom and lady-apples. The oldest recorded vineyards of the Nahe are located in this part of Norheim. "In this humble taster’s opinion, these are the greatest Rieslings on earth. No other wine, anywhere, exceeds the clarity, polish, complexity and sheer beauty of flavor of this grower’s finest wines. Simply, like the most perfect Riesling that can ever be. Winery Notes"
Stephen Tanzer 92"Rich golden- yellow color.The nose offers l uscious yellow plum, honeysuckle and sweet spice, layered with a delicate hint of botrytis.Smoky pineapple jam and an elevated minerality animate the palate. Dense, juicy and long on the finish."